Earlier this week, MS Dhoni landed himself in soup after he stormed into the middle and confronted on-field umpires at the Indian Premier League. It happened during a nail-biting final over contest between Chennai Super Kings and Rajasthan Royals, when umpire Ulhas Gandhe signaled a no-ball, only to deny it. 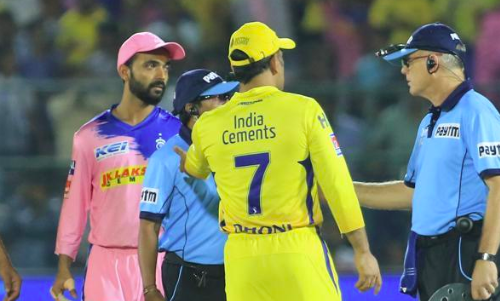 Chennai captain Dhoni was so furious that he stormed into the middle and started pointing fingers at the the umpires, briefly disrupting proceedings. His former teammate and ex-India captain Saurav Ganguly brushed off the controversy saying ‘everyone’s human’. “Everyone’s human. What stands out for me is his competitiveness, which is remarkable,” Ganguly said during the press conference following his team Delhi Capitals’ win over Kolkata Knight Riders on Friday night. Ganguly’s words may surprise a few, given the fact that Dhoni’s garnered a lot of criticism from some of the former players like VVS Laxman, Michael Vaughan and Sanjay Manjrekar.